This BDM pod supports most S08 chips running at 5V, and implements a standard 6-pin BDM connector. It requires no external power, as it receives power from your target board. This pod is based on Freescale's D-BugS08. The big advantage of D-bugS08 over other BDM pods is that it has a very user-friendly interface, through any terminal program. There is no host software to install, and it is completely platform-independent. You can connect to any target and immediately examine memory contents, disassemble code in the target chip's memory, erase and re-program flash from an s-record file, etc. With other pods, you can't easily take these actions. These features make it especially useful for field troubleshooting and firmware updates. Just connect the supplied ribbon cable to the target board's "BDM IN" connector, making sure to line up the pin 1 indicator with pin 1 on the BDM connector. The host for the BDM pod can be any type of computer running a terminal program. The BDM pod will receive its 5V operating power from the target board through the ribbon cable. A couple of suggested Windows terminal programs: TeraTermPro and MiniIDE. MicroBDMS08 is a minimal 9S12 board, running D-BugS08 v1.0.0b6. It consists of the MCU, a crystal, an RS232 interface circuit, and a few miscellaneous components, all mounted on a small board less than 2 inches square. A 6-pin ribbon cable is attached to one edge, and a 9-pin D-sub connector is on the opposite edge, and the whole assembly is housed in a small plastic box. 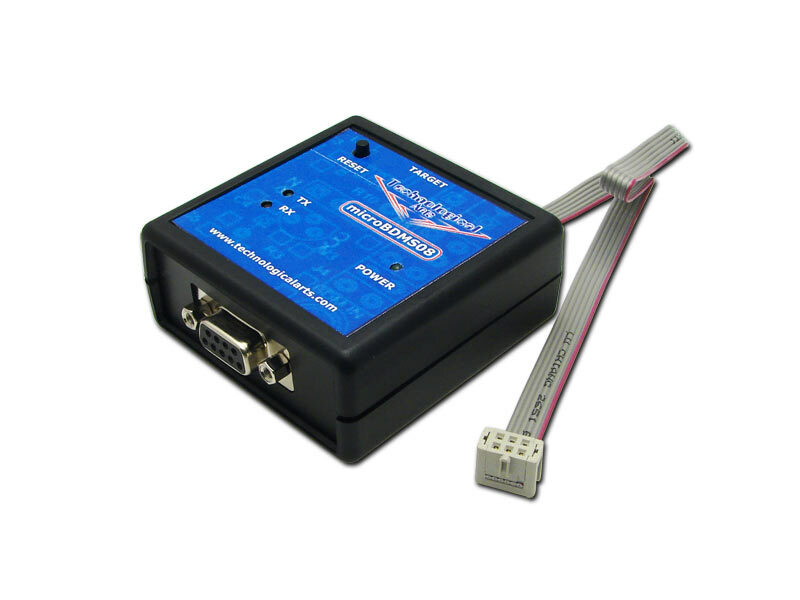 A 9-pin serial cable is included for the PC serial port interface. If D-BugS08 ever needs to be updated, it can be done using an S12-compatible BDM pod. By opening the box, applying a DC voltage (5 to 9V, nominal) to the power connector on the circuit board, and moving two jumpers to make the ribbon cable function as BDM IN, the board becomes a target, and Flash can be erased and re-programmed as needed.